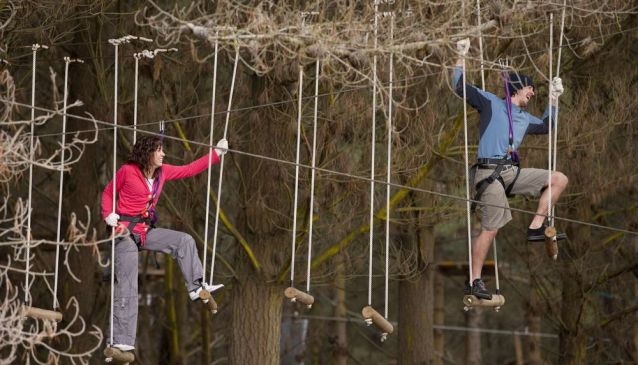 Get down and dirty at New Zealand's largest Adrenalin Forest adventure park with testing aerial and land-based challenges for all the family. At Adrenalin Forest in Porirua, Wellington, there are 125 challenges waiting to test your mettle. There are seven different pathways, from easy ('Discovery'/'Adventure'), to medium ('Excitement'/'Excitement+'/'Thrill') to jaw-droppingly scary ('Adrenalin'/'Adrenalin Max'). They will present you and your friends with so many ways to test your commando skills, jungle stealth and aerial wizardry, as you compete for bragging rights and find out who the true soldiers really are. Anyone can take part - mum, dad, the kids, the boss (! ), as long as they're over 1.30m tall. Climb rope ladders, go zooming down the flying fox, or get lost high in the trees above you, as you complete each individual pathway of challenges, and head towards a terrifying yet exhilarating climax. Do as many or as few activities as you like, there's no rush, except that rush of adrenalin coursing through your veins once you've hurtled across the forest floor, down that zip wire at high speed. Go harder, go stronger and go higher at Adrenalin Forest for a truly unique day in the Great Outdoors. Great for birthday parties, office trips, family days out and corporate training. All visitors are given a detailed safety briefing before heading onto the course, and securely attached to a safety wire at all times. Height restrictions apply. 1.45m tall is the minimum size to do the whole course 1.30m tall is the minimum size to do pathway one and two only. November - April: 10am - 2.30pm (last start), May - October: 10am - 2pm (weekends), 11am - 2pm (weekdays).